Starting my own pop-up bakery business in February has already been such a fruitful and exciting experience. I have learned so many valuable lessons about entrepreneurship and have improved my baking skills by 110%. It’s neat for me to take part in every step of the production process, from buying ingredients at the market to baking at home, and eventually seeing people enjoy my baked goods right in front of me. This meticulous, hands-on approach gives each one of my pop-up bakeries a special homemade touch. For the past several weekends, I have set up shop at Kaldi Coffee in Atwater Village, a hip and rapidly developing L.A. neighborhood. 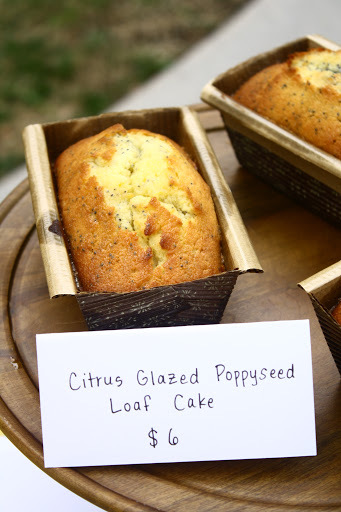 I load up the trunk of my car with baskets of chocolate chunk and oatmeal-raisin cookies and cake stands for citrus-poppyseed loaf and almond cake. Creating treats to pair with coffee has been an interesting challenge for me. All of my offerings are subtly sweet with ingredients like orange zest, clover honey, and Medjool dates that provide complex, refined notes of flavor. To me, an excellent dessert is one you eat slowly and mull over the different components that make it so good. I gain inspiration by going to bakeries, ordering a handful of items along with a glass of water, and spending time analyzing each one in between sips of water to cleanse my palette. For most people, this process is too time-cosuming and tedious, but doing it makes me even more passionate about my own little bakery. 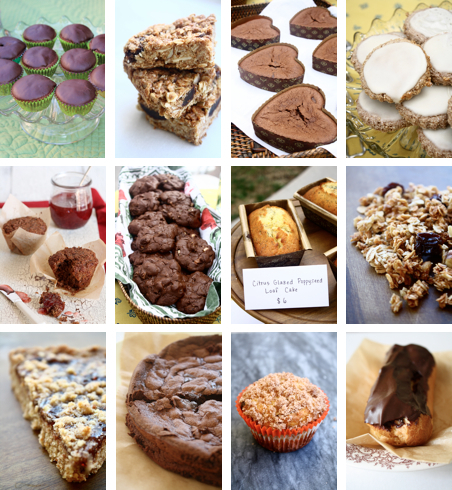 I hope that eating my products gives people the happiness and excitement that I feel when creating these baked goods. One of the most rewarding aspects of my pop-up bakery at Kaldi is receiving compliments from customers in-person and online. 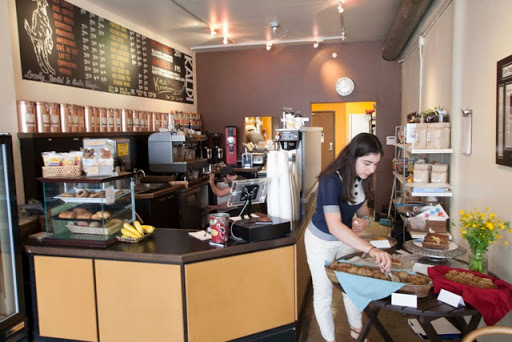 If you would like to connect with Maral’s Bakery online, “like” www.facebook.com/MaralsBakery for updates on where I’ll be and when, new menu items, and special orders. If you are an L.A. local, visit Kaldi Coffee tomorrow April 28 to meet me and pick up a treat. 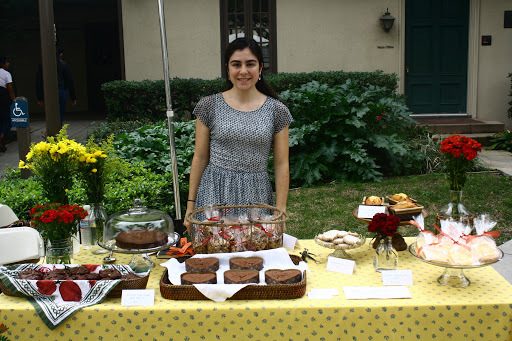 Most Sundays, 10 a.m. – 2:30 p.m.
As many of you know, I have started my own pop-up bakery business for my high school Senior Project. I recently “popped up” at The San Gabriel Mission Playhouse for the opening weekend of Peter Pan presented by the Pasadena Civic Ballet. It was a beautiful show, and the environment around the auditorium was joyful and bustling. I decided to use a green and purple theme to match the colors of the performance. I loved the way the plush green tablecloth made everything pop. Various shades of green and purple ribbon dressed up basic cellophane bags and differentiated products from one another. My mom’s flower arrangements really completed the look of my table; I love the freshness and ease that they add to the spread. 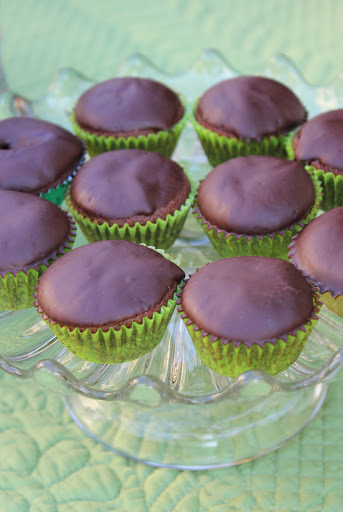 These chocolate friands with mirrored chocolate glaze are a French take on a traditional American cupcake. Rich and decadent, they resemble flourless chocolate cake in flavor and texture. They looked absolutely adorable in mini liners, perfect for popping into your mouth during a few minutes of intermission. 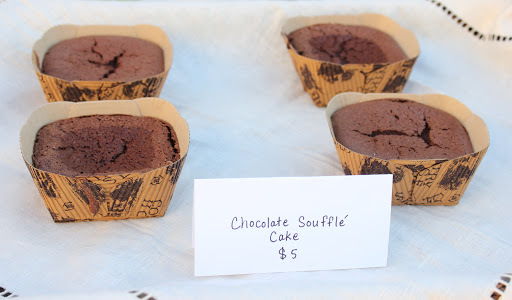 My chocolate soufflé cakes have become something of a signature item. How could you resist a cloud-like chocolate dessert served in one of these mini baking molds? I loved watching little kids jump up and down at the sight of them, pointing excitedly and tugging on their parents’ arms to ask for money. So cute! 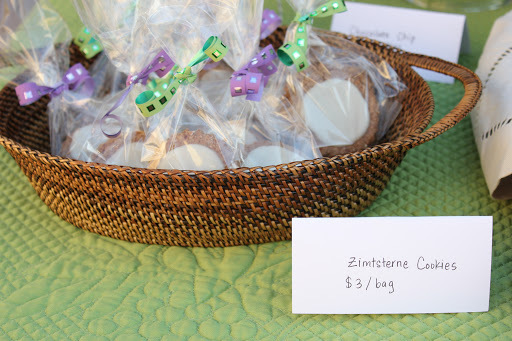 I made zimtsternes for my first event at the Summer Opportunities Fair. After receiving such a positive response from customers, I had to bring them back. A traditional Swiss cookie made with ground almonds, honey, powdered sugar, and cinnamon, they are barely crunchy on the outside and soft in the center. 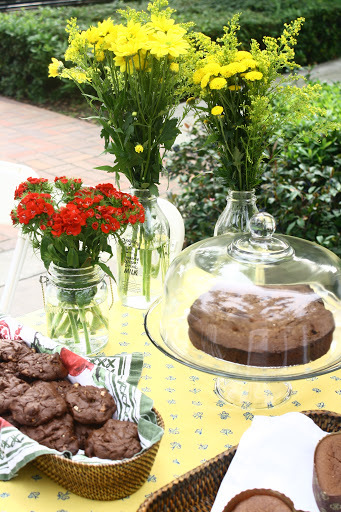 Other items included grapfruit-olive oil loaf cake, and oatmeal raisin, lemon shortbread, and chocolate chunk cookies. The event was a great learning experience for me, because I branched out to an unfamiliar venue and catered to a unique crowd of people. It is important for me to adapt my presentation and tweak menu offerings based on where I am and who I am serving. After this event, I appreciate the expression, “It’s all about the customer.” While I have to stay true to my aesthetic, I must also be aware of my audience’s desires. It is exciting for me to learn new lessons with every project I take on. Follow Let’s Live La Vida on Facebook to see where I’ll be popping up next. If you have any inquiries or would like me to cater a private function, please email me at maral.lavida@gmail.com. 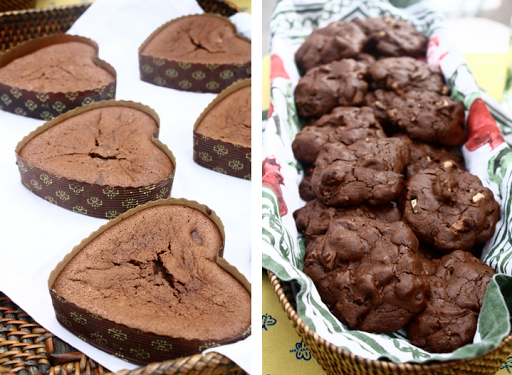 Chocolate soufflé cakes and brownie drop cookies with walnuts, by far the two most popular items of the day. I came up with the idea for my project during the middle of my junior year, but have fantasized about opening my own bakery for a while now. I daydreamed about designing a space and baking dozens of beautiful goodies, but never thought about the hours of meticulous planning and labor required to open up shop for a day. After a week of deliberation, I decided to make rustic, French-inspired goodies because they felt the most natural to me. I baked until 2 a.m. the morning of the fair, and woke up at 6:30 to finish up some last-minute items and package everything. 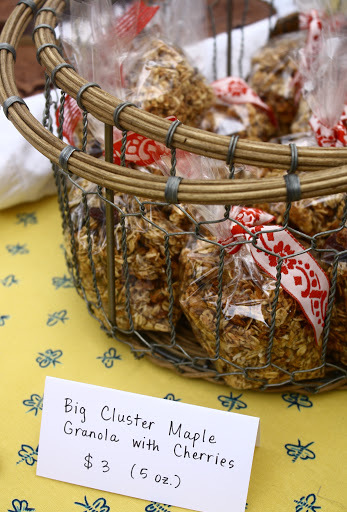 The final menu included heart-shaped chocolate soufflé cakes, citrus-glazed poppyseed mini loaf cakes, chocolate pecan torte, brownie drop cookies, zimtsterne cookies, lemon shortbread cookies, and big-cluster maple granola. I learned so much from this experience, and everything sold out within a few hours! 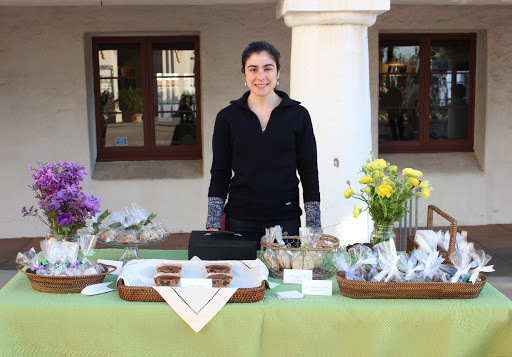 It was so satisfying to tell people about my project and to see their genuine interest in my baked goods. I felt great when customers returned to my stand two or three times to buy additional items or to tell me how much they enjoyed something. I love to bake for family and friends, but receiving genuine compliments from complete strangers elevated my excitement to a new level. One major lesson I learned is that presentation is key. Many people stopped at my stand because of how aesthetically pleasing and professional it looked, with a vibrant yellow tablecloth and bouquets of flowers fresh from the farmers’ market. Investing time and care into packaging products and arranging them on beautiful platters really paid off. 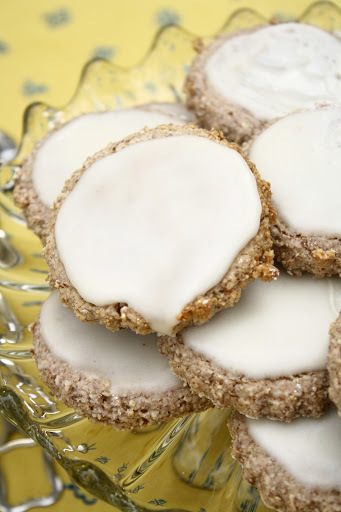 Zimtsternes are traditional Swiss cookies made with ground almonds, powdered sugar, cinnamon, and honey, and topped with a simple glaze. For my first pop-up bakery, I was thrilled with the outcome of the day and everyone responded so well to my desserts. I also recognized many aspects that I can improve upon, mostly related to the business side of things. I’m still figuring out appropriate pricing, and would like to optimize my time in the kitchen by prepping certain recipes in advance. My sister and my mom helped me with every step of the process, from brainstorming menu items to assisting me with baking, and I could not have succeeded without them. Starting in March, I will pop up at various locations in the Los Angeles area. Follow Let’s Live La Vida on Facebook for specific details about location and time. If you would like more information about my project, or would like me to appear at a private event, please email me at maral.lavida@gmail.com. I cannot wait to see how my business grows in the coming months!